In Closed Session, the Board approved Superintendent Cheryl Jordan's recommendation for Shangrila Mia-Ramzan, currently Assistant Principal of Pomeroy Elementary School, as the new principal of Zanker Elementary School, effective July 1, 2018. During Jordan's report in Open Session, she introduced and congratulated Mia-Ramzan on the appointment. "There is something unique about Shangrila, and that is that she was a parent here at Zanker where she served on (Community Board Advisory Council) and PTA and was and is a big part of the community," Jordan said. Following the introduction, Mia-Ramzan came forward to thank the Superintendent and Trustees for the opportunity. She noted the appointment being especially noteworthy, since it happened during an offsite Board Meeting. "This is kind of surreal for me, especially being here at Zanker and having this opportunity to collaborate with team Zanker and move our school forward," she said. "It just makes it that much more special and sweet for me as far as the memories that I have and the memories that I look forward to creating." She added: "I am truly humbled and very excited to be able to collaborate with all stakeholders, and really give back to what was home, what is still home, and is going to continue to be home for myself and my family." Watch the full video of Mia-Ramzan's speech during the Board Meeting online now. In Closed Session, the Board also approved Superintendent Jordan's recommendation for Maria Hartman-Hernandez, currently Assistant Principal at Curtner, as the new principal of the elementary school, effective July 1, 2018. During Jordan's report in Open Session, she introduced and congratulated Hartman-Hernandez on the appointment. "One thing that always stands out in my mind about Maria is she asks why. Why is always at the foremost of everything she does and at the center of that why is kids," Jordan said. After being recognized, Hartman-Hernandez came forward to share an excerpt from her background "that has helped to shape the educator you see before you today." As an educator of 14 years, she said her first five years were spent working in central North Carolina in an area of very high poverty. She shared an anecdote about one of her students in Durham, at Parkwood Elementary, and how she saw him grow despite struggles he encountered with his family. "When I reflect on the words of the MUSD mission statement, 'We provide learning opportunities for all, and create nurturing environments where students are inspired and empowered,' I am reminded of the foundational first years," she said. "I am reminded of students like Wesley and the power of seeing a person's potential regardless of life's conditions." 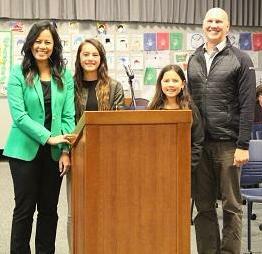 Watch the full video of Hartman-Hernandez's speech during the Board Meeting online now. 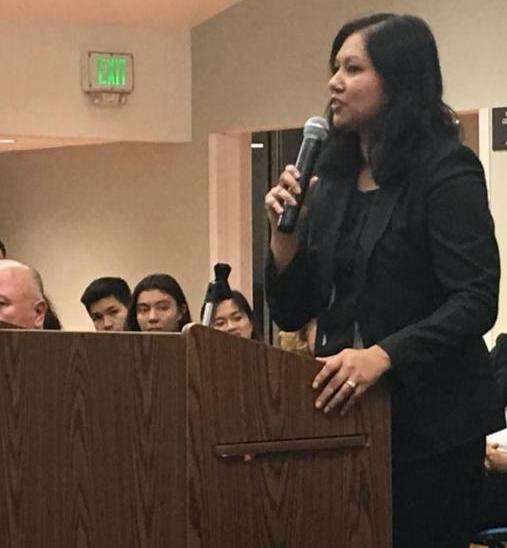 Hartman-Hernandez will take over for current Curtner Principal Dr. Jackie Vo-Felbinger (pictured), who was named principal for the new elementary school, Mabel Mattos, during the January 23, 2018 Board Meeting. Vo-Felbinger is starting her work at Mattos while remaining at Curtner for the remainder of the 2017-18 school year. Mattos will open in phases, with the first scheduled for 238 students in August 2018. 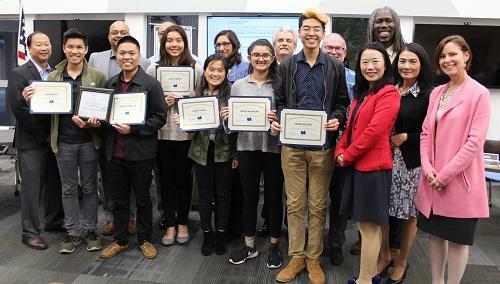 Superintendent Jordan and the Board of Education recognized MHS Advisor Brett Webber and students from the group Milpitas Model UN for attending their first ever conference at Santa Teresa High School in January, where they were recognized with the award for Excellent Research. The team, led by Isaac Chang, Andrew Ha, and Darryl Remulla, prepared for over two months to represent Iran in mock debates and crisis situations, mimicking the real United Nations. "Our goal is to foster consensus and understanding and to foster diplomacy for other people," Ha explained. "It's different than other competitions where our goal is to win. We focus on making solutions to large, real-world problems. ... The amazing thing is we have been able to create, in a short year, a community dedicated to fostering solutions to finding out new ways to understand other people and other communities." The Board of Education unanimously approved Resolution 2018.21 recognizing April 16-20, 2018 as Public School Volunteer Week. Superintendent Jordan explained this is an annual resolution the board adopts, before holding its Public School Volunteer Recognition, scheduled for the May 8 Board Meeting. Board Clerk Hon Lien read the resolution into the record, before it was adopted by an unanimous vote. "WHEREAS, volunteering is central to the American character and is a fundamental expression of responsible citizenship," the resolution states. 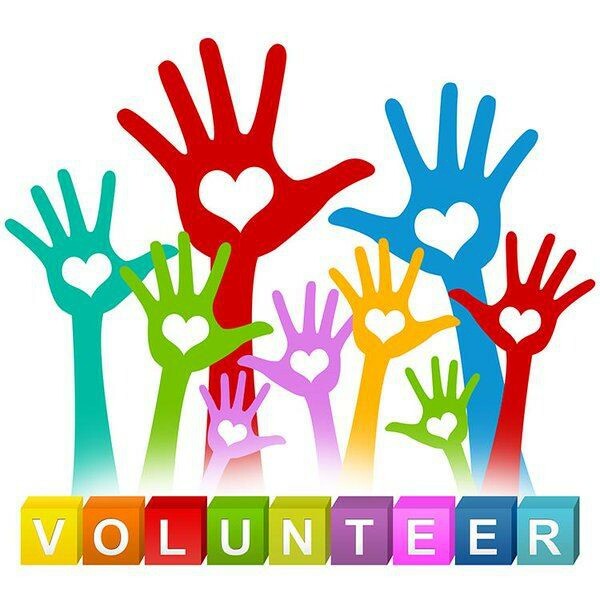 "...WHEREAS, volunteers also provide essential support to our public schools by mentoring and tutoring students, helping in classrooms and school activities, and helping in raising much needed funds for local schools; and WHEREAS, according to the Bureau of Labor statistics, there are more than 60 million Americans who volunteered last year through charitable organizations"
The Board of Education unanimously approved Resolution 2018.22 recognizing May as National Asian/Pacific American Heritage Month. 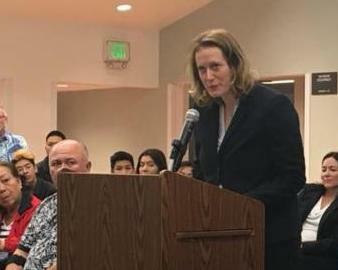 Superintendent Jordan said this is the first year the District has adopted the resolution, which keeps with the new theme of adopting a resolution each month that represents the diversity that is seen across Milpitas Unified School District. Board Member Robert Jung read the resolution into the record, before it was adopted by an unanimous vote. "In 1992, the official designation of May as Asian-Pacific American Heritage Month was signed into law," the resolution states. "...WHEREAS, May was chosen to commemorate the immigration of the first Japanese to the United States on May 7, 1843, and to mark the anniversary of the completion of the transcontinental railroad on May 10, 1869. The majority of the workers who laid the tracks were Chinese immigrants."